The creator of "Dual! Parare Run Run Monogatari" (offically subtitled as "Dual! Parallel Trouble Adventure") was none other than the very person who was responsible for the creation of the original Tenchi Muyo! OVA series, Kajishima Masaki. Besides the incredible character design, the story also features exceptional mecha designs and computer CG enhancements. 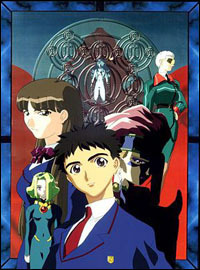 The series carries many similarities to the Tenchi series, one of the most obvious one would be the hundred and eighty degrees change of life style for our hero of the series, Yotsuga Kazuki, a common-place high school student who lives a normal life until the day he discovered his ability to see things from another dimension. And after being transported to the parallel dimension by Sanada Ken, Sanada Mitsuki's father, a leading physicist who specializes in dimensional manipulation theories and researches, Yotsuga Kazuki found himself being titled as the savior of the world who may possibily posses the only power that can fight off the evil army who declared war on the entire world.